Mattress Wallingford: Why Do I Need a Bed Frame? Do I Need a Bed Frame? Welcome back to the Mattress For Less blog! On our blog, you can find all the answers to your most asked questions about mattresses. Not sure what size of mattress you need? Read our last blog post! Ready to buy your first mattress, but not sure what you need to know? Check out one of our last posts! Peruse the Mattress For Less blog archive for most posts, but feel free to contact us or come by one of our locations! We would love to help you find a mattress that you love. Today, we are going to answer one of those commonly asked questions: do I need a bed frame? The answer is yes and no. 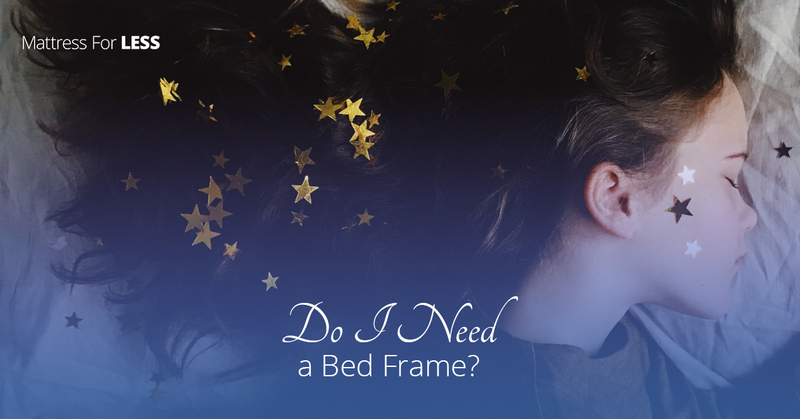 You don’t have to have one, but it is highly recommended that you do, especially with certain types of beds and here’s why. First of all, a bed frame provides support for your box springs. Because your box springs is essentially a wooden box, it can scratch wood flooring and other floor surfaces. Also, without a frame there isn’t much that is keeping your mattress on your box springs. A bed frame can provide support for the box springs increasing their longevity, keep your bed together, and protect your flooring — what isn’t to love about a bed frame? A bed frame can also provide storage space. If you are living in a small room or in a home that lacks sufficient storage, putting your bed on a frame can give you the storage that you need. What can you store under the bed? Anything! Invest in some plastic storage containers that have wheels on the bottom and that, of course, fit under the bed, and store extra bedding, towels, out-of-season clothes, gift wrapping, and more under your bed and out of the way! Getting a mattress off the floor and on a bed frame can keep your bed from getting moldy and musty from mildew, and it also keeps it out of reach of pests. Because the bottom of the bed is off the floor and exposed, more air can circulate around it and keep it from becoming or staying damp. You can also avoid the insect problems that come with mold and other gross situations. Are you constantly cold during the winter months? A bed frame can also keep you warm! How so? You are off the floor which tends to be one of the coldest parts of the house. Also, heat rises which means that the higher your bed sits, the warmer the air will be! Bed frames come in a variety of shapes and styles so you can express your style! You can buy a bed frame that already comes with a headboard, or you can buy a simple frame and attach a frame that you like. The options are endless allowing you to create the perfect bedroom oasis for you in your Wallingford home! Come shop at Mattress For Less and see the difference! We can not only provide you with a mattress that fits your budget, but all the other essential parts that you need. Come shop at one of our locations in Waterbury, Newington, and Wallingford, and buy your mattress for less!